A practiced team with many seasons behind them mixed with fierce ambition, and a quick recovery from what could have cost them the main trophy, delivered Martin Hill’s Estate Master the Farr 40 John Calvert-Jones National Championship on Sydney Harbour by three points. “We had a six point lead going into the last race and on form we thought that was a comfortable margin to have, but on the very first beat we heard a clunk and someone said ‘the genoa’s coming down’,” Hill described. “It was the worst case scenario; we moved into last. The guys were excellent; they changed the halyard and we were sixth around the final top mark and ended up fourth in that race. “We showed today why we are national champions. We won all three regattas beforehand and we had the form. It wasn’t easy, Angophora was right on our tail, they had similar speed and great tactics and we were both mixed up in tacking duels and gybing duels all series. “The broken halyard was our test. The final result is usually determined on the last leg in Farr 40 racing and that’s how it ended today. We are happy. I’ve been in the class 10 years and have two state titles but never a nationals. It’s very pleasing to get our name on the trophy,” the emotional and relieved skipper added. In their final regatta now the boat has been sold, Guido Belgiorno-Nettis’ Angophora crew threw the lot at Estate Master, but it wasn’t enough to put a dent in the latter’s season-long dominance and quest to finally claim the class’ revered Australian title. Though he would have relished a seventh Australian title as his parting gift, Belgiorno-Nettis said, “Estate Master has sailed well all season and put pressure on us the whole time. Congratulations to Martin and Chappo (David Chapman). “My ten years in the class has been an extraordinary journey. We won six Australian titles and the places in the world I’ve travelled with my crew….the Dominican Republic, Newport RI, San Francisco…. all those great waterways you wouldn’t get to sail on otherwise. And to sail against the best in the world, and have them on board – Tom Slingsby, Nathan Outteridge and Iain Jensen, and John Kostecki – has been a privilege. Third overall was Lang Walker’s Kokomo and first Corinthian team was Jeff Carter’s Edake. “We are always in the transition between the pro boats and the Corinthian boats, which are all improving rapidly as they learn how to get that last one percent,” Carter said. “They shouldn’t give up, it takes a long time. I’ve been at it for 11 years and had my time at the back of the fleet. Putting together the whole program, working it yourself, it’s almost harder being Corinthian as you have limitations on sails and sailors. 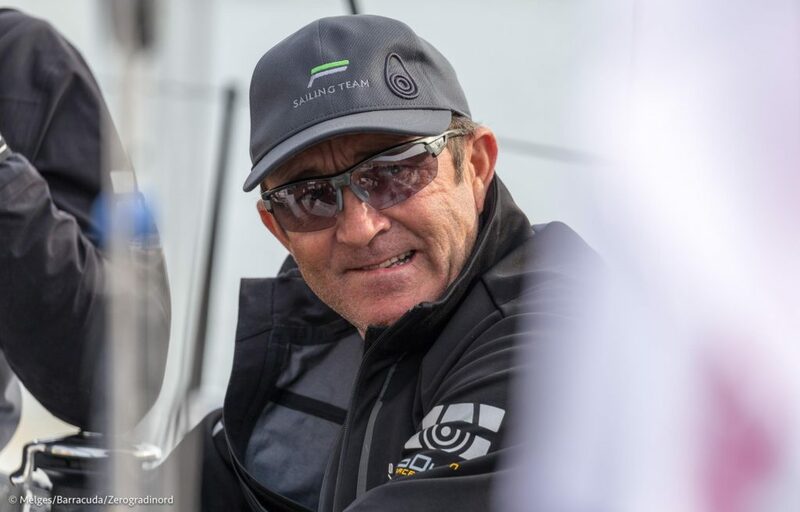 “I thought Zen winning two series races was excellent for Gordon (Ketelbey), who’s only had two full seasons in the class, and Double Black was extremely fast in the heavy airs. This is a tough class. There are no favours handed out to get in the top three,” Carter added. Following a fortnight of southerlies in Sydney, the eight-boat Farr 40 fleet and all the other classes and recreational boaties out on the harbour enjoyed a welcome late blast of summer – warm temperatures and a classic north to nor’easter up to 19 knots by mid-afternoon. At the final trophy presentation Farr 40 Australian president Gordon Ketelbey said, “Today the class says farewell to Guido. He’s been a stalwart, though we all expect him to get tired of his Melges 20 and come and sail on a real boat again,” he teased. The Royal Sydney Yacht Squadron has been the home of the Farr 40’s season pinnacle event for many years and PRO Rod Ridley and his team ran another successful schedule both inshore and offshore.